Famous North East faces can be spotted at the wedding of the property millionaire to Louise Roberts. Douglas’s dad and mam Sir John Hall and Lady Hall were there along with former Newcastle United chairman Freddy Shepherd. Freddy’s brother Bruce Shepherd was also at the wedding on the Rock. Douglas, 52 and 34-year-old Louise, tied the knot at the King’s Chapel, a military garrison church, followed by a reception party at the members only club run by Louise. One guest said: “It was a really lovely day with Sir John welcoming Louise into the family during a speech at the reception. Louise, who grew up in Heaton and Walker in Newcastle, is believed to have been so happy with how the day went she is planning to offer her club, Fifty-Five, as a wedding venue. She wore a white wedding dress and her sister Leanne was her bridesmaid. The best man was Malcolm Walker, who runs the Beamish Park Hotel in County Durham. Louise and Douglas worked together in the 1990s when she was a secretary at Newcastle United and he was Deputy Chairman. Property millionaire Douglas infamously branded all Newcastle women as “dogs” during the Toongate scandal when he was caught out in a tabloid sting. Freddy later rose to become chairman of the club, but Douglas moved to Gibraltar where he is a director in Sir John’s property development company. Douglas, who was divorced by his ex-model wife Tonia in a multi-million pound settlement in 2006, has lived on the British owned peninsula off the coast of Spain for the last few years. After the Toongate scandal Tonia left their property on the plush Wynyard Hall estate but returned to him for the sake of their sons John and Gregory, now grown up. 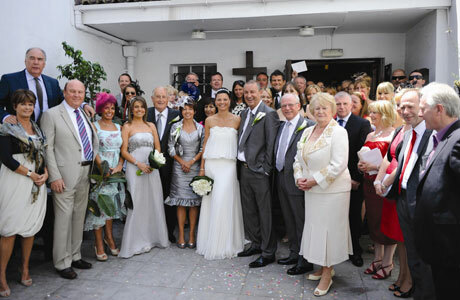 But the marriage broke down after he was accused of romping with prostitutes in Marbella. Their divorce settlement eight years later is believed to have cost him around £4m. The new Mrs Hall has taken on the reins of Fifty-Five, a private members club in Gibraltar, half an hour’s drive from Marbella.